Walking Fort Bragg: I see they finally did it. There has been talk over the years of changing the name of our town. 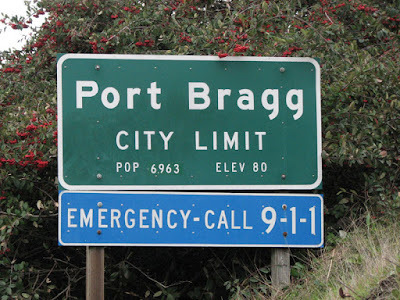 One of the reasons given is the confusion with Fort Bragg, North Carolina. Another, the fact the town was named after General Braxton Bragg, a rather unpopular man who never visited the area. 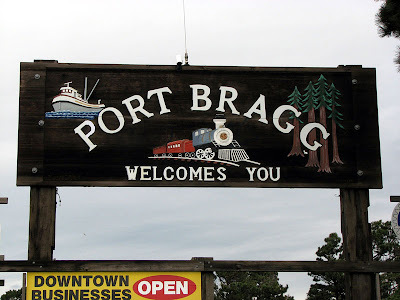 Some folks disliked the idea that "Fort Bragg" was originally built to control the coastal Indians. This year the issue flared up again. There was lots of back and forth in the Fort Bragg Advocate's "Letters to the Editor" section. City Hall took notice, Town Hall meetings were held, a variety of names suggested and a simple solution came forth. HE HE !! very good great photo shop work. interesting and strange how these things get decided. Does this mean you'll have to change your blog name? Now I know what you did yesterday instead of walking. Yikes! You had me good. ha! if it wasn't for the comments I would have fell for it. I've talked to some people who are firmly against any change, so I'm glad yours is a little foolishness. Personally, I'm for a change, so there you have it. HA! You totally got me! I surfed in, just saw your blog somewhere, and thought, I have to check this out. 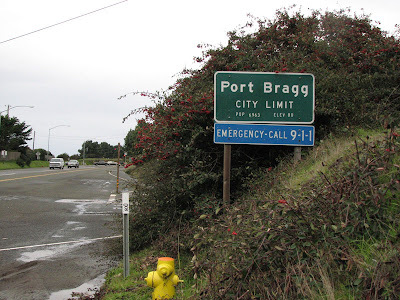 I myself have spent many days wandering Ft. Bragg, having grown up in Willits. My dad fished out of Noyo on a boat called the Paul G.